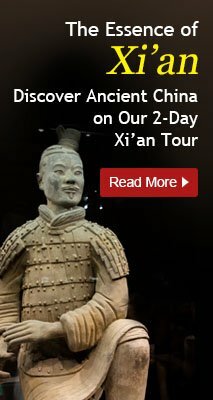 Along with Beijing Xi&apos;an is one of the two most famous historic ancient cities in China. 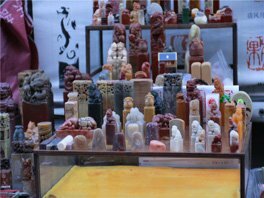 Xi&apos;an is rich in cultural relics, antiques and artworks. 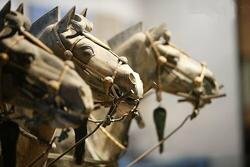 Replicas of the Terracotta Warriors and Horses, paper-cuts and folk paintings are the most popular buys in Xi&apos;an. These items and many more are sold in antique shops at street markets around the city. The luxurious shopping areas are centered mainly along Dong Dajie (East Main Street), Nan Dajie (South Main Street) and Jiefang Lu (Liberation Road). Department stores usually open at about 9am and close at 10pm. Located between the ancient Bell tower and Drum tower, Century Ginwa Shopping Mall is a high quality, exclusive shopping center. There are over sixty world-famous brands for discriminating customers, including Bally, Burberry, Dior, Givenchy, Lancome, Estee Lauder, and many more all of which make Ginwa a fashion center in Xian. It is one of Xi&apos;an&apos;s top department stores, selling food, clothes and many other things. It is located at 103 Jiefang Lu and open from 9am to 8:30pm. Kai Yuan Shopping Mall is situated in Dongdajie. It is one of the biggest shopping malls in Xi&apos;an. With reasonable prices and good quality commodities, as well as good facilities, Kai Yuan enjoys a good reputation in Xi&apos;an and is a very popular shopping mall. Shu Yuan Men (Book Courtyard Gate), a well-known ancient-style street, is located by the ancient city wall, behind the Forest of Steles. Numerous local arts and crafts including replicas of antiques, paintings and paper-cuts are sold on the crowded street all year round. 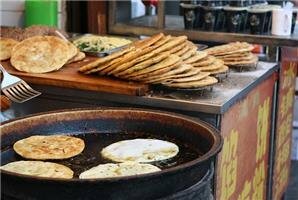 It is a place that most tourists like to come to on their first visit to Xi’an. Xi&apos;an Antique Market is located at the intersection of Zhuque Lu (Red Sparrow Road) and Nan Erhuan Lu (South Second Ring Road), near the Small Wild Goose Pagoda. There are also various antiques sold in the street. Serious curio collectors from all over the country seem to vie with visitors in seeking treasure. You need to remember very few of the exquisite looking products you see at the market are genuine antiques. Wenbaozhai means Cultural Treasures Room. It is situated at 5 Yanta Lu Zhongduan (Wild Goose Pagoda Road Central Section). The shopping center enjoys a good reputation among tourists. 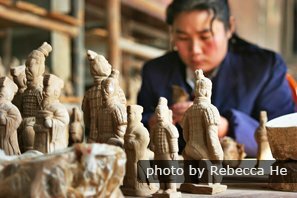 There are silk rugs, woolen blankets, silk clothing, jewels, jade articles, calligraphy, paintings, historical relics, antiques, clay models of the warriors and horses, and models of the bronze chariots and horses on offer. It is situated in the east suburbs of Xi&apos;an City. The Gallery exhibits a great number of paintings by country folk, as well as other folk crafts such as paper-cuts and shadow puppets. If you are interested in the craftsmanship, you can ask some of the craftsmen to teach you how to paint a puppet and cut paper. It is a popular shopping place for tourists from home and abroad. 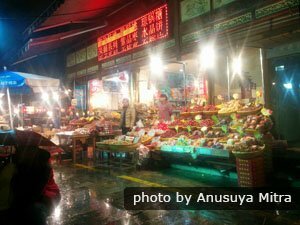 Huimin Street is not a name for an exact street but a call for the accumulation area for the Hui Minority in Xi&apos;an consisting of four streets which are Beiyuan Gate (北院门), Huajue Lane (化觉巷), Xiyang Market (夕阳市) and Dapi Yuan (大皮院). No matter you want some unique souvenirs, relish some snacks in Hui style or appreciate the architectures built in Muslim style, Huimin Street would be a nice destination for you. The world&apos;s finest carpets are made entirely of pure silk. These highly valuable creations are visually stunning and exquisite to the touch. Silk, unlike wool or cotton is lightweight yet infinitely durable when afforded proper maintenance and care. A silk carpet is not only a treasure for a lifetime but can become a treasured heirloom. Whether you choose a carpet as a floor covering or as a unique and decorative wall hanging it is guaranteed to give good service and to be a joy to all who see it. The range of carpets we offer are of mainly Persian and Chinese designs, with both the warp and the knots consisting of pure silk. Each carpet is hand woven in time honored traditional ways, while the finest natural and synthetic dyes are used to ensure the carpets retain their remarkable designs. This kind of furniture is made of padauk teak and elm. They are same with the common furniture use, but has the very high collection value.